Everyone knows I’m a major screw up in the kitchen. It hasn’t always been that way. I was even named “Cook of the Week” by my local newspaper back in 1974. I still have the yellowed, dog-eared issue of the Wednesday food section to prove it. But something has happened to reverse all my culinary prowess. I’m blaming it on hormones which is as good as anything else to blame it on. Lately I’ve been doing scary things like leaving the eggs out of my quiches, forgetting to put the chicken in my chicken spaghetti, and blowing up a hot dog in the microwave. The list came to a head last week when I burned up my $175 Le Creuset Dutch oven. For the uninformed, Le Creuset is fancy line of French cookware which is ridiculously expensive and claims to last a lifetime. Well, apparently not MY lifetime. I burned the bottom slap out of it last Saturday morning while innocently trying to brown a pot roast. I added oil to the pot and plopped in the beautiful roast and turned my head for one second (okay maybe it was 15 minutes) and began to smell paint burning, or what I would imagine paint would smell like if it caught on fire and didn’t explode. The bottom of my beautiful Dutch oven is now a black mess and the enamel is gone….stuck to my beautiful roast. There went dinner, not to mention my pride and joy. 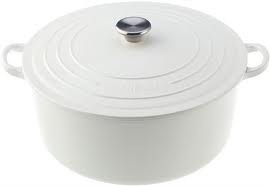 I always left the pot on the cooktop like I had a pot of stew bubbling perpetually. Frankly I was just proud to have a pot which still had its matching lid. I’m not throwing it out. In fact, I’ve turned it into my garbage bowl – the place I dump my vegetable clippings and coffee grounds before transferring them to the compost pile. So much for Le Creuset. This entry was posted in General Stuff and tagged How to burn up Le Creuset, Le Creuset destruction, Screw up in the kitchen by Emily Jones. Bookmark the permalink. Emily! I guess now you only have one option left, cast iron. Let’s see, how could you mess up cast iron? Oh, no! I remember when you got that pot! I have had a set since Mack and I married in ’69 …..soon to be 44 years next January! I use my yellow Le Creuset every day! Love it…..Next time I am at your house, let me have a look at yours. 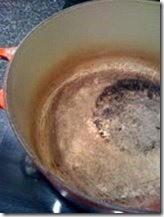 I have some Le Creuset cleaner that we can try…. So, do you never cook on high with it? My cooktop doesn’t even get very hot, so I’m puzzled why it burned up – of course I did get distracted for a few moments. Anyway, I found a cash iron dutch oven at Boardtown trading post so I’m in the process of seasoning it now. Just won’t have a pretty pot any longer, but I do love my black cast iron. You would think not Norma. But I seem to have magical powers that enable me to destroy the indescructable. Superman wouldn’t have survived long at my house! I ran across your post doing some consulting on Le Creuset. I know LC has some of the best warranty in the business. 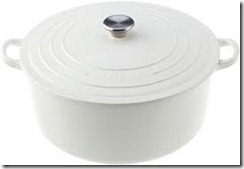 Did you file a claim on this pot? Even if its not covered under warranty, they will generally allow you to purchase the same piece at cost! !